Advocate for Effective Economic Development Resources. Members Provide Resources to Communities and Businesses. Represent Montana’s Economic Development Professionals. Updates on Programs & Funding Opportunities. 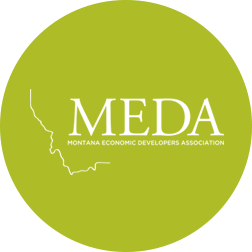 The Montana Economic Developers Association (MEDA) is an association of economic development professionals. We are professional "lead" economic developers, business specialist, government employers, and staff members of affiliated non-profit organizations which promote and foster economic development activities in Montana. View the website for full information.